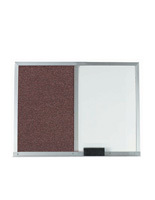 This Cork Board is in an Aluminum Metal Frame with a Chalkboard and a Tray for Accessories! This Cork Board is a High Quality Notice Board for Purchase at CorkBoards2Go.com! 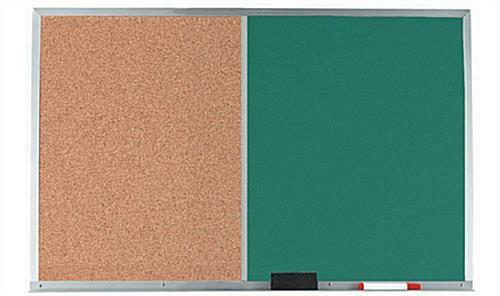 Common Size: 24" x 18"
36" x 24" 72" x 48"
This cork board is a combination chalk & cork board. Total dimensions are 24" wide x 18" high. (Chalkboard: 12" x 18"; Corkboard; 12" x 18") The left half is cork and the right half is green chalkboard. Includes storage tray to handily hold your chalk and eraser. This is the ultimate in communications and exceedingly flexible...post your paper memos on one half and write down other information on the chalk half. Incorporates an aluminum frame and rear mounting brackets to hang on your wall. Comes comprehensive with a box of chalk and eraser so it's ready to go right from the box. 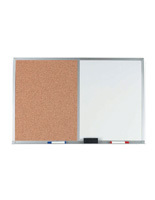 Outstanding seeking and extremely effectual cork board combo unit for schools, offices and communications with workers. Ships via UPS or FedEx.